“Detox” has become a trendy buzzword, but detox (or cleansing) is a time honored tradition that can help you regain balance, lose weight, sleep better, increase productivity, and gain clarity. According to Traditional Chinese Medicine, autumn is the season that supports the lung and large intestine, major organs of elimination, which are easily hindered by an overburdened liver. or just generally feeling puffy or inflamed? A congested and overworked liver could be the culprit. While it’s true that the liver is the body’s own self cleaning device, it can become easily overwhelmed by toxins from our food supply, too much booze, over the counter and recreational drugs, birth control pills, cosmetics and body care products, and pollution. Everything you eat, drink, breathe and apply to your skin must be detoxed by the liver, and if you take in more toxins than your liver can process, it becomes sluggish, and symptoms result. guidelines for the 21 day detox plan. Your detox kit (cost not included in class tuition) contains a vegan detox protein smoothie that provides the structural breakfast cornerstone to your meal plan. They are tasty and simple to make, and are formulated to support the liver’s natural metabolic pathways. In addition to smoothie, you’ll enjoy tons of vegetables, gluten free grains, good fats, organic protein and fruit. Vegetarians and non-vegetarians alike will consume ample protein whether from plant sources or from organic animal protein. This is not a fasting program. Gradually you will reduce and/or eliminate coffee, sugar, alcohol, processed foods, gluten and dairy for 21 days. With group support you will be so pleased at what you can do and thrilled with the results. AND you get all this– the meeting, the ongoing support, AND the book for $49 (detox kit and acupuncture package extra). Phone meeting takes place Saturday, October 5 from 10am-noon. You do NOT have to be in San Francisco to participate! I am in philadelphia and I would like to participate in the long distance version of the class. How does this work? Skype sessions?? or will everything just be emailed to me?? Thank you. I would really love to participate even though I live in philadelphia. You will get all the materials emailed, along with access to our support forums and personalized recommendations about additional products (aside from our detox kit) for your cleanse. 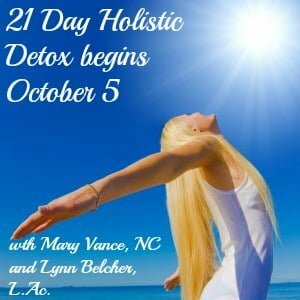 The detox kit costs $105, and the fee to participate long distance is $49. You can register via paypal here! Ok thank you for the quick information on the cost of the herbs for liver detoxification. However as I went to checkout, there doesn’t seem to be a way to pay for the kit? Only for the program (I’ll be doing the long distance as I’m in Germany – but I have a US mailing address that the herbs will be mailed to that then gets sent over here so no worries). the fee is for the class, support, materials and NOT for the kit. We’ll give you all the info you need about the kit and how to get it. Hi Mary I am local but not able to have the meeting Saturday. Is it possible to work something else out if I sign up? Thank you! Yes! The intro call will be recorded so you can play it back at your convenience.